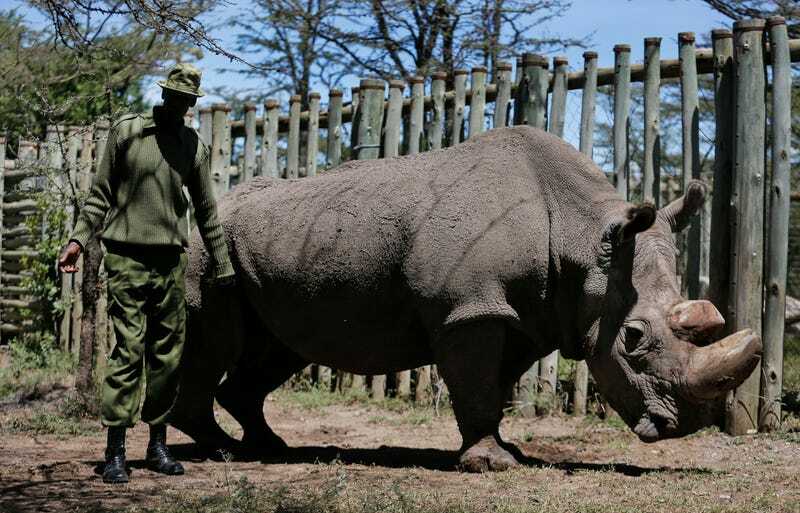 The odds of survival for the northern white rhino have seemed slim for the past few years. Once a thriving population, there are just three left on the entire planet, and the only male, a 45-year-old named Sudan, is old and has shown little interest in mating with the two remaining females. Earlier this week things got worse, as Sudan’s bedsores (a product of his age), showed signs of infection. Conservation workers reported yesterday that Sudan’s condition is slowly improving, however they’re not holding out “big hopes” for a miracle recovery. Keeper James Mwenda, feeds two female northern white rhinos left in the world, and a southern rhino in the pen where they are kept for observation, at the Ol Pejeta Conservancy in Laikipia county in Kenya Friday, March 2, 2018. Rhinos have been under pressure for hundreds of years due to habitat loss and hunting. But things really got nasty in the 1970’s when poaching took off. The price of rhino horn, which is touted as traditional medicine in several Asian countries, is at the heart of the problem: at more than $30,000 per pound, rhino horn is worth more by weight than gold, diamonds or cocaine. Despite an international ban on rhino horn trade and increased protections for rhinos across Africa and Asia, the number of rhinos killed has increased every year since 2008; over the past 9 years, almost 2 rhinos were killed every day. Hopefully Sudan will recover from this latest illness, and have a few more years on this planet. But that won’t dramatically change the equation for the northern white rhinos. And they aren’t alone in this march towards extinction. The western black rhino was declared extinct in 2011 as a result of poaching; the Sumatran and Javan rhinos are both critically endangered; and all five rhino species are considered threatened.